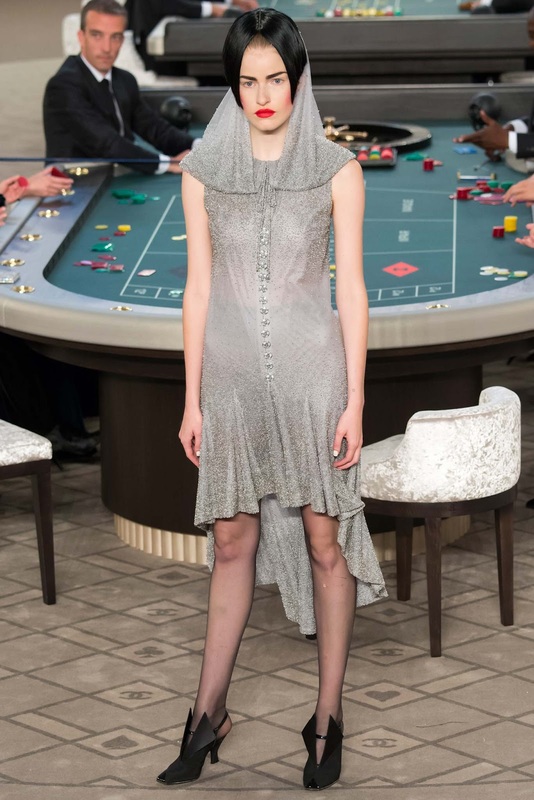 Blackjack tables, roulette, poker, and slot machines filled a bright white room, full with money, glamour, and of course, risk! 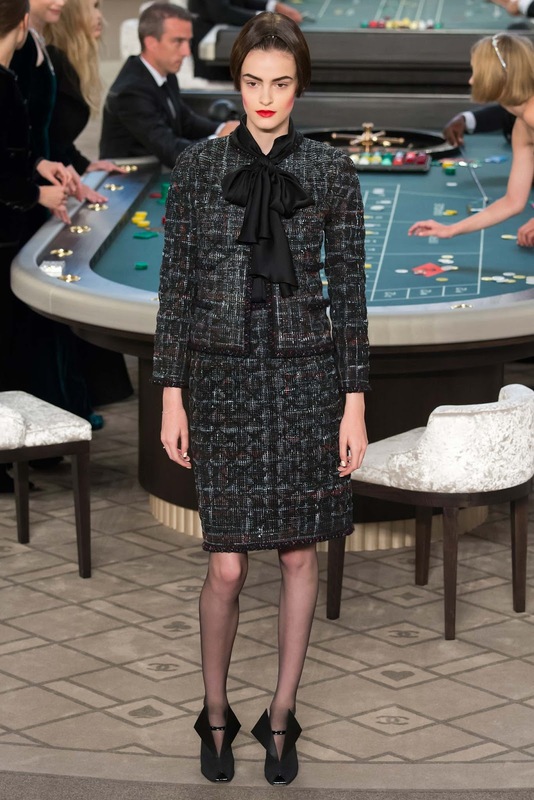 However, conducted by Karl Lagerfeld, Chanel couture parade for the fall 2015/16 season was way out of the risk. 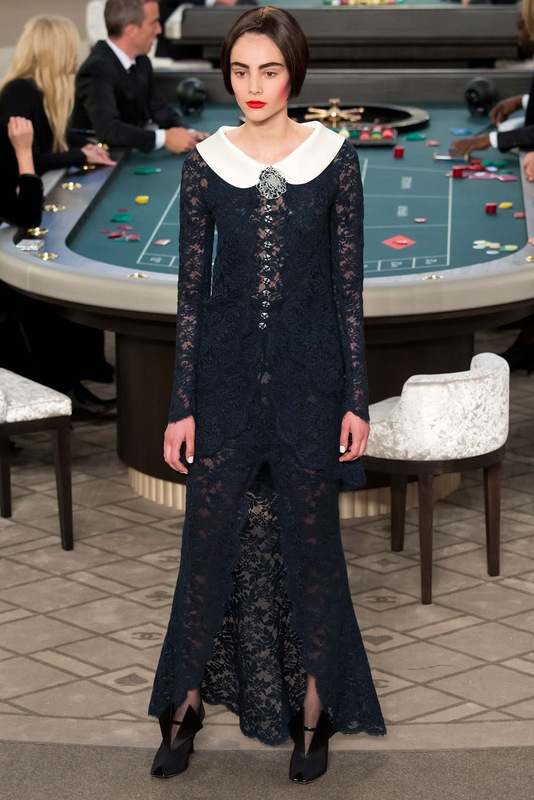 Grand Palais was transformed into a Chanel Cercle Privé, an exclusive casino club studded with stars on board. 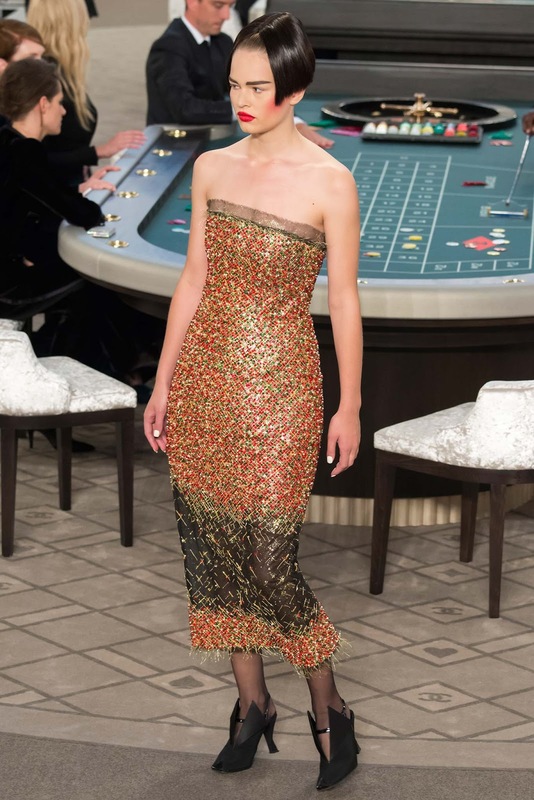 Kristen Steward, smiling as she entered the gambling arena, followed by Geraldine Chaplin, Rinko Kikuchi, Rita Ora, Lara Stone, Vanessa Paradis, Stella Tennant, G-Dragon, Baptiste Giabiconi, and Julianne Moore, each wearing a Chanel outfit specifically made for them a la haute couture, and showing off pieces from Haute Joaillerie, Chanel's exclusive jewelry line. Karl is a polimath who masters the method of how to create a show that is thick with cruel satire, typical of France, and a polite protest but subtle, style of Germany. 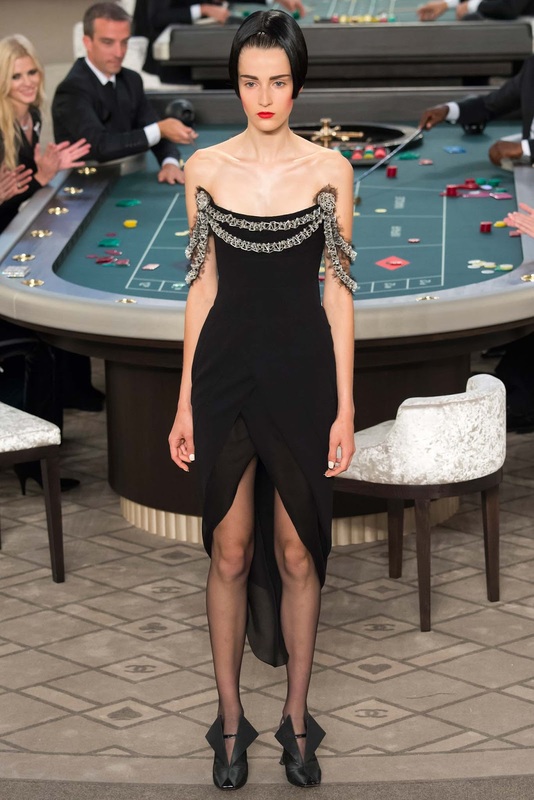 Casino symbolizes bets with money, and given the Greek crisis, which then has impacts on the EU economy, including Germany (Karl is a German), one of the creditors to help Greece overcome its financial problems, it seems to me that Karl protested the German government, to declare that it is a stupid thing to gambling with money. "I am gambling with the idea", he said. 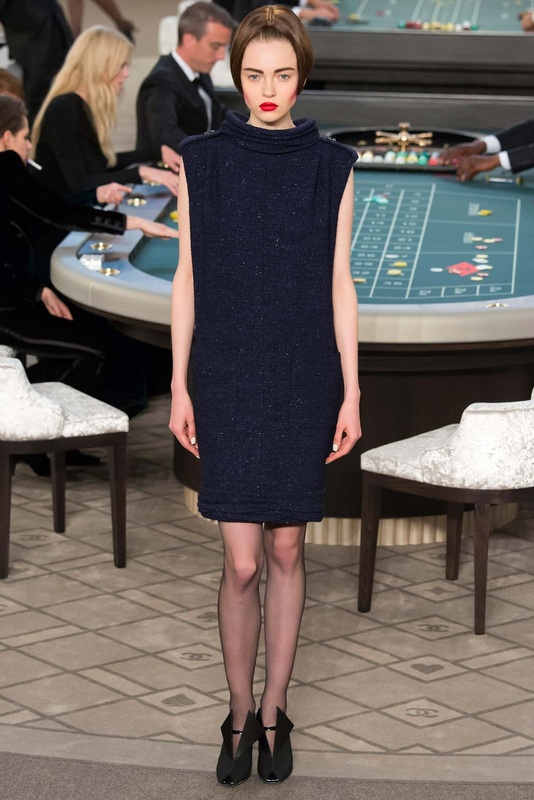 "And as in fashion, where trends can not be created on purpose, I create something like I was playing with the cards. Different game, different combinations of cards so that I can win". 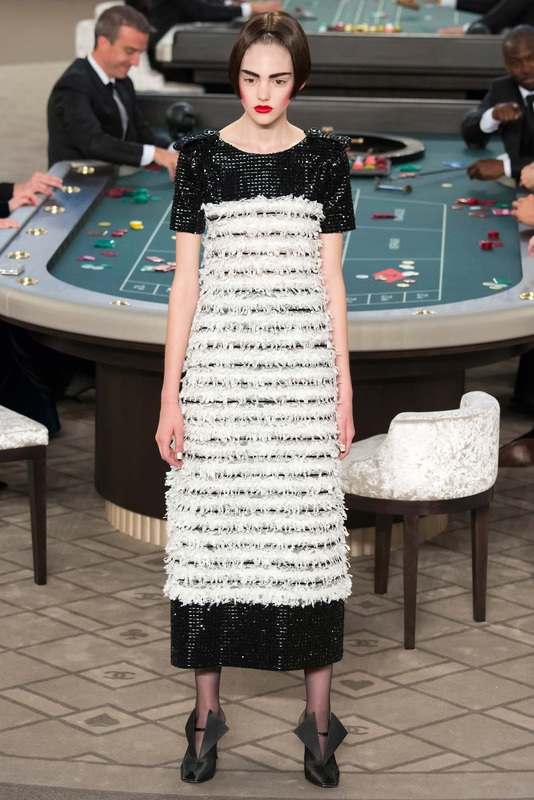 This time, Karl's card combination was: refurbished iconic Chanel silhouette with little jackets, set grande, top celebrities, and new techniques in the world of fashion: laser sintering, which is a technique that allows the connection of material without seams. Imagine a shirt without seams, without pause pattern, and perfect precision. Embroidery of a thousand pearls was applied on a piece of clothing. 3D geometric sequin showed how modernity and the contemporary mingled with traditional broad-shouldered jackets and satin dresses. 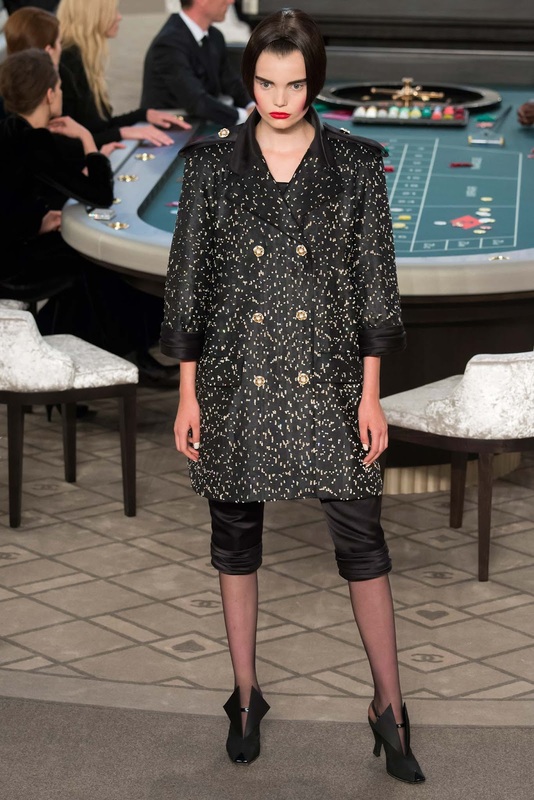 Borrowing the idea of ​​a little black jacket which then given a military touch, this collection was a little mysterious, dark, but with a level of plenary luxury. The last exit, a pants suit and white pearl silk and satin completed with dangling tails, was worn by Kendall Jenner. 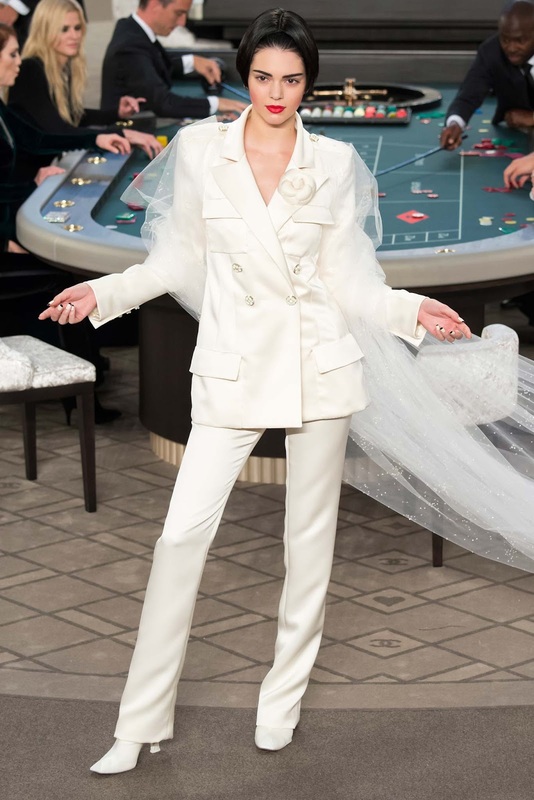 A manifestation of masculinity that remains romantic, Chanel bride this time was the finale of firm expression and confidence. 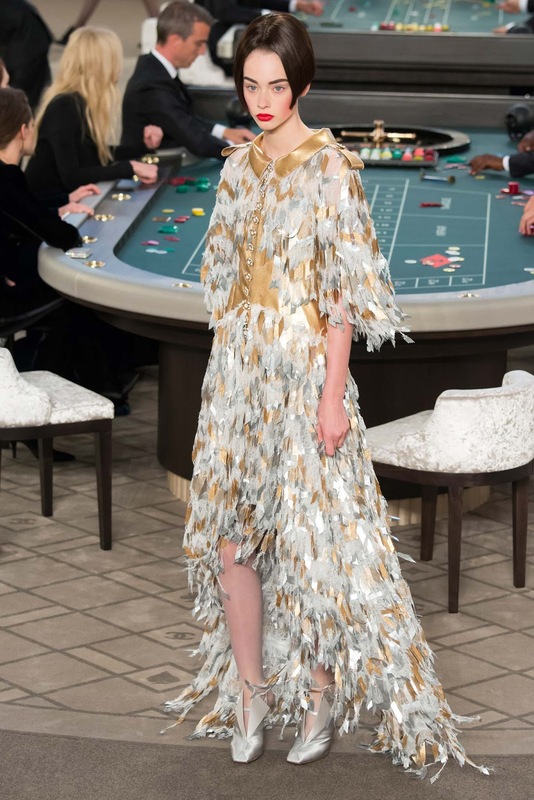 It's common knowledge that in the world of gambling, the house will always win, and from season to season, Karl the Kaiser always manages to 'cheat' the world of fashion by showing something new, if not in the silhouettes, at least the concepts and techniques. Fans will feel immediately in need of Chanel. Dying for! Need in life! Can not live without! Nevertheless, like a gambling with the finite chance to win, perhaps a more appropriate phrase is, we want it. For complete runway images and my review in Bahasa Indonesia, hover to Style.com Indonesia.